Knitting is a technique of producing fabric from a strand of yarn or wool and its name appears to have derived from the old English verb to knot (cnyttan) and the Dutch for the same (knutten). Knits appeared for the first time in Peru in the 3rd Century. Egyptians, followed by Spanish, Scottish and Brits embraced the art of knitting focusing on warmth and war necessities through an array of knitted accessories such as socks, scarves etc. The 1920s embraced and enlarged the array of knitwear to sweaters and fashion thanks to Coco Chanel. This trend inspired a whole generation of home knits. Starting the cold days colorful! 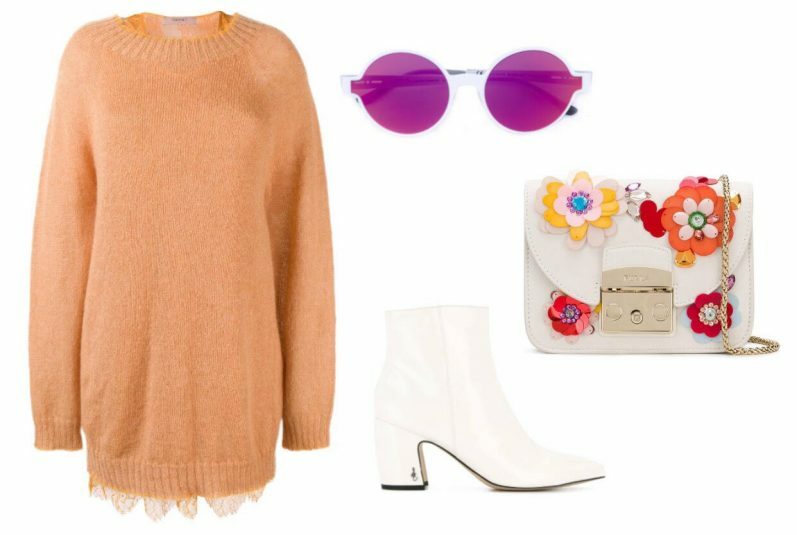 Get yourself a Camel-coloured mohair wool knitted dress from Twin-Set featuring a ribbed round neck, long sleeves, a short length and a ribbed hem and cuffs and combine it with white leather block heel ankle boots from Sam Edelman featuring a side zip closure, white multicolour leather floral appliqué Metropolis crossbody from Furla and a pair of white and pink round tinted sunglasses from Italia Independent. Embrace Autumn with Iro. 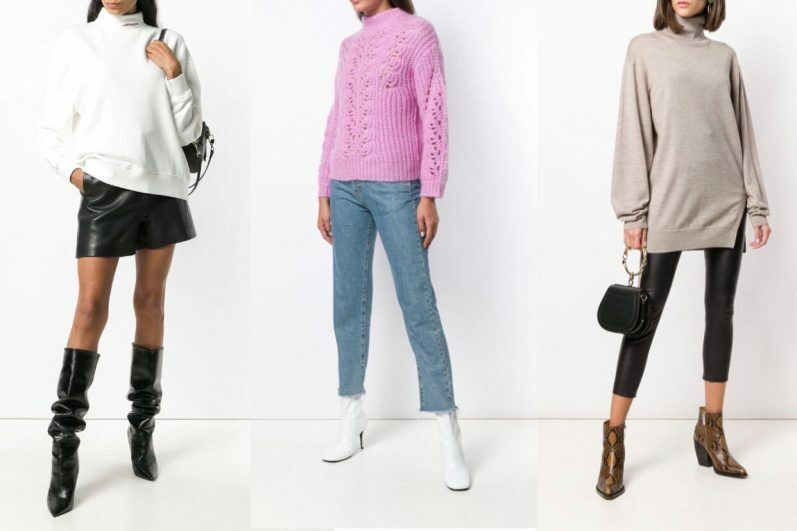 Choose from a white cotton sweater featuring a stand up collar, long sleeves, a relaxed fit and embroidered Experience logo or a dusty pink wool-kid mohair blend crochet turtleneck sweater featuring a crochet design, a turtle neck, long sleeves and a ribbed hem and cuffs. Last but not least, Taupe wool Arno roll neck sweater featuring a roll neck, long sleeves and a ribbed hem and cuffs. The 1950s and 1960s massively extended the span and prints of knitwear in clothing and home decoration. A period of saturation followed and a revival saw the light in the 21st Century with an impressive DIY movement that included choice of natural fibers such as alpaca and merino as well as innovations in yarns. 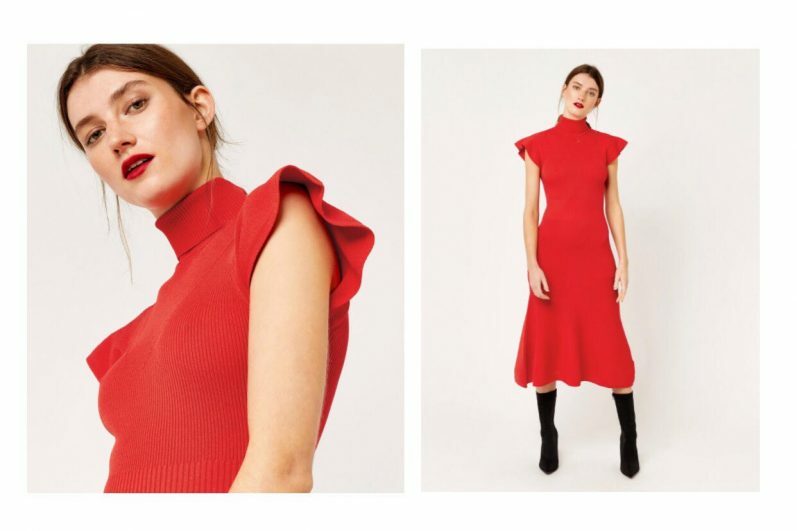 Make a statement with the flare sleeve rib dress. Designed for just a little costume drama, it features a high neckline and short sleeved with a frill effect. Its fine rib texture smoothly hugs your form, and it’s finished with a flared midi-length hemline. This AW18, cuddle and indulge yourself in soft textures from head to toe as it will brighten the long and dark winter days ahead. Knitted dresses that seem to be have been worn for ever will comfort and highlight our silhouettes as we choose to wear them oversized and fluid such as in Joseph. 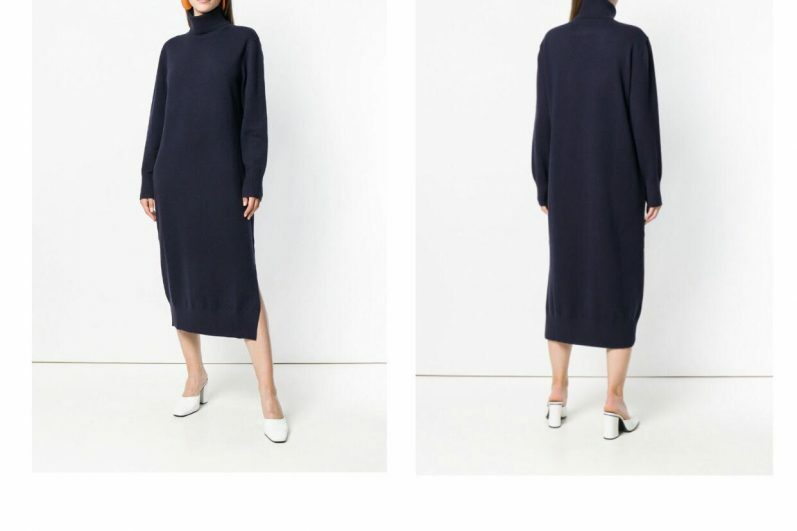 Navy blue wool blend long knit dress from Joseph featuring a ribbed roll neck, a ribbed hem and cuffs and a relaxed fit. 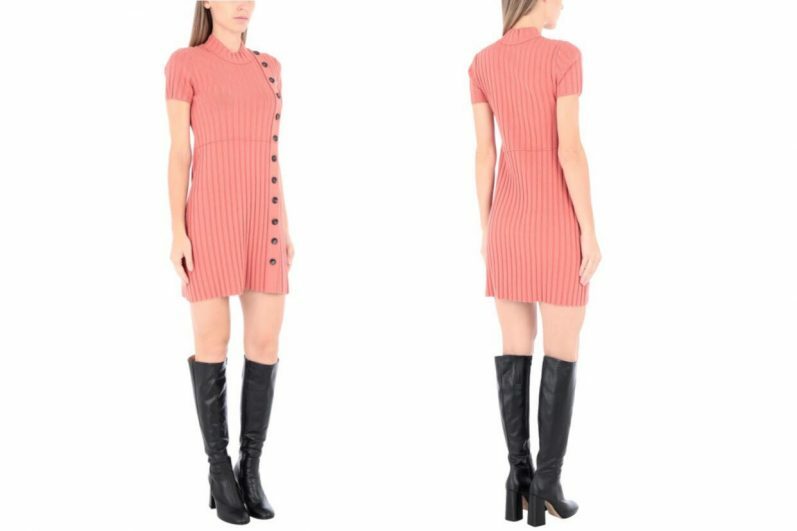 Or opt for a fitted or column dress such as in Reiss, Free People. The cool-grey Audrey dress is knitted to a sctructured composition with a cut-away detail just underneath the rounded neckline. Wear it to add a little interest to casual weekend looks. Knitted Dresses are a must have for cold autumn days. 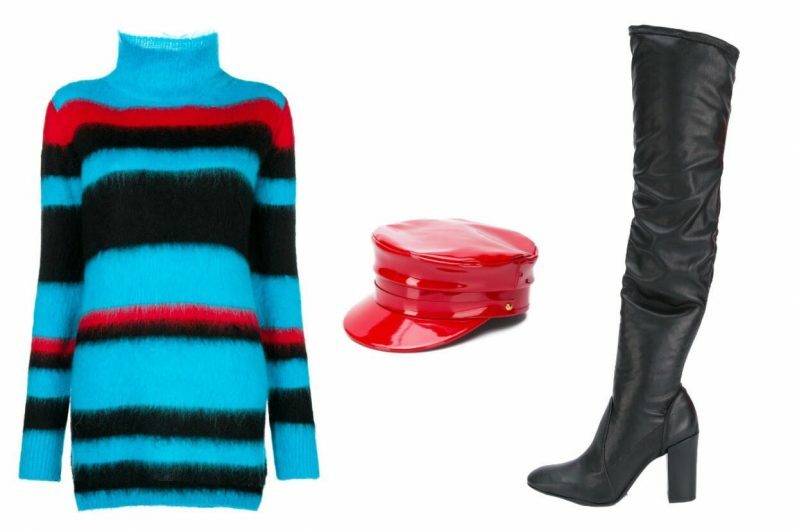 Combine a blue mohair knitted dress from Dondup featuring a halter neck, a ribbed hem and cuffs, long sleeves and a short length with some black leather knee length boots from Schutz. Give your look a bigger wow effect with a red patent leather biker hat from Manokhi.